“Le Cetinelle” bed and breakfast is only 5km from the centre of Greve in Chianti, but a world away from the hustle and bustle of the tourist trails. There are breathtaking views over the Chianti hills to the city of Florence in the north west as far as the area of San Gimignano in the south. The guests can enjoy total relaxation in the b&b and its surroundings, or use it as a base to visit some of the most beautiful cities in Tuscany, Florence is only 30km away and Siena is about 40km away. The strategic position of “Le Cetinelle” allows visitors to easily reach San Gimignano, Volterra and Monteriggioni. It is also possible to visit Arezzo, Pisa, Lucca and the Tuscan coast in a day. The “San Michele Natural Park” is four kilometres up the road from “Le Cetinelle”. This is situated on the highest peak of the Chianti mountains at almost 900 metres above sea level. The park is a great attraction for the people of the surrounding area who visit during both summer and winter seasons. During the Autumn the mushroom hunters are out in full force! There are many hiking and mountain bike trails starting from the park heading out to the hidden hamlets and hilltop villages of Chianti, such as Lamole or Volpaia. The house is surrounded by a large garden where there is a pool with a fantastic view over Florence and the surrounding hills. The vineyards and olive groves where Luca produces his organic wine and olive oil are an integral part of the panorama. “Le Cetinelle” is also a perfect place for family holidays, thanks to its restful and relaxing atmosphere; with all the open spaces and childrens' play equipment it is a great place to bring your children and your pets! 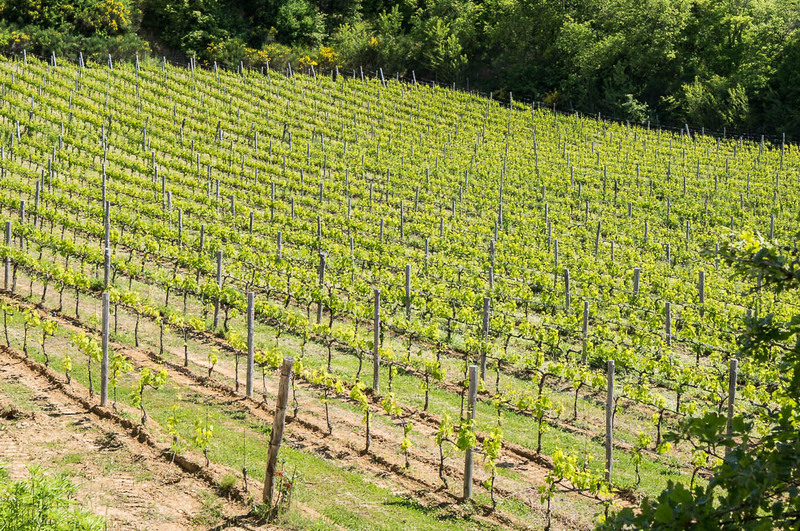 The Chianti area is a fascinating mix of nature and culture in a rural setting. Your holiday awaits and above all we look forward to meeting you!!! Montefioralle is probably one of the most beautiful villages in Italy. The stone houses face onto the single, narrow cobbled street of the village. It is a magical place where the only sounds you will hear are those of nature. The original name of the village was 'Monteficalle' probably named after the fig plants that grow all around the fortfied village. You can reach it either by car or on foot from Greve in Chianti. If you wish to explore other medieval villages take the “Chiantigiana” road SS222 heading south and you will come to Panzano. Panzano was one of the most fortified centres in the medieval period and today you can still admire the remains of the castle and visit the Santa Maria Assunta church which is an integral part of the castle and was reconstructed in the 14th century on the site of the original ancient place of worship. Nearby you can visit the important Pieve of San Leolino which dates from the Romanic period in the 8th century, and the oratory of Sant'Eufrosino which was a site of pilgramage linked to the worship of a natural spring with special powers (the Well of Sant'Eufrosino). Continuing south along the “Chiantigiana” road you will come to a junction with indications for Radda and Volpaia. Radda is a splendid medieval town which still conserves its characteristic windy streets and sturdy walls. During the day you could visit some vineyards to visit a wine cellar and taste some wine and olive oil. And don't miss a stop off in a typical trattoria for a light lunch and then end the day with a romantic Tuscan meal in one of the fabulous hillside restaurants. You need at least a whole day to visit Florence with its abundance of churches, museums and exhibitions. You can reach the city by car or take the very convenient bus from the centre of Greve in Chianti straight to the centre of Florence. Another day is needed to visit Siena which is reached by going south along the SS 222 road that ends at the gates of the city whose historic centre has been desiganted as part the patrimony of mankind by UNESCO. The city is the home of the Monte dei Paschi di Siena, the bank founded in 1472 and thus the oldest bank still in activity in the world. Take a day to visit Pisa famous for its marvellous and unique Piazza dei Miracoli (Square of Miracles) with the Leaning Tower, and Lucca a roman colony dating from 180 b.c. now a lively city which still contains many characteristics of bygone days. A day to visit the lovely towns of San Gimignano , famous for its towers , Volterra, known for its alabaster and the historical centre dating from Etruscan times, Monteriggioni a castle where time stands still within its walls and Colle Val d'Elsa famous for its production of cristal. It is also worthwhile spending a day out in Arezzo, where one of the most important Antiques fair in Italy is held in the main square, the first Sunday of the month and the preceding Saturday. From here you could also visit Cortona, a strategic centre of the Chiana valley, and a beautiful medieval town. It is also possible to spend a day at the seaside: the Pisa Marina has beautiful free beaches, only an hour and a half's drive away. The ideal holiday – a day out visiting the marvellous villages of Chianti, and a day of total relaxation at “Le Cetinelle”, reading a good book and sipping on a glass of our house wine and a dip in the pool for a little sporting activity! What more do you want from life!